Think you'd "never" do something based on your likes or dislikes? Think something will "never" happen because of your situation? I find that whenever I say "never" it's due to pride. My pride. Either it's because I'm living a "holier than thou" moment and think I'll "never" do something based on what I see others doing or have done, or I'm saying "never" because I've already been through something and I'll "never" do, deal with, have, go, own, like, etc -- fill in the blank -- whatever it is I'll "never" participate in. Or it's because I have no faith in a great future. Meaning, my view is the only view. Two things I pretty much always said "never" to was dresses (I didn't wear dresses for the longest time) and pink. Hated the color. Never to dresses? Not sure why. I probably wasn't comfortable in my own skin when I said never to them. Like for twenty years. Then I got back into then when I started selling vintage and basically have had to backtrack and own up to the fact that I HAVE BEEN MISSING OUT. That's what "never" does, to you. Saying "never" makes you miss out on what the universe is trying to give you. What God is trying to teach you. And never to pink? Not sure. Maybe thought it was too girly and I'm really not a girly person. Except that I am because I love dresses. Okay, I'm really not that girly. Trust me. I'm not. But, no pink? Hello, missing out here. Pink comes in a zillion shades. This dress for example, has two different shades of pink in it and it is gorgeous. I mean, the combination is drop-dead gorgeous. So, here's your bit of wisdom for today. Never say never and watch amazing things happen. Also, watch how similar we all are when we say never. What do I mean? Okay. So, you think you'd never treat someone a certain way? Find yourself in that situation and see what you'd do. You think you'd never get yourself involved in a less-than-optimal scenario, or never own a minivan, or never drink more than ten cups of coffee in a day? Hardly. You just haven't been given the opportunity yet. Humanness, weakness, anger, hunger, depression, loneliness, all of it will make us do things we never thought we'd do. Now, convictions about a thing are something else. That's not what I'm talking about here. I'm talking about a blanket statement that I've said, using pride to cover my insecurities. The thing about pride, the stinking, crazy, amazing, awesome, eye-opening thing about pride, is that the "never say never" opportunity will teach us we are being prideful, and we need to deal with it when it rears its ugly head, if when we don't think pride is an issue. When I say "never," I'm taking empathy out of the equation for me. "Never" is becoming intolerant, sad, and just plain ugly. So, I can't understand someone of a different socio-economic background or political background because I"ll "never" vote that way, or live that way? Really? That's so absurd. Empathy puts me into someone else's shoes. It takes my "nevers" and makes them "evers." I'll "ever" try to love like you, I'll "ever" try to understand you, I'll "ever" take what it is God wants to give me, even if I don't think I want, like or need it. I'll also "ever" wait for God's blessings, too! Never say never, my friends. Enjoy everything. Be thankful for everything. Choose good things. 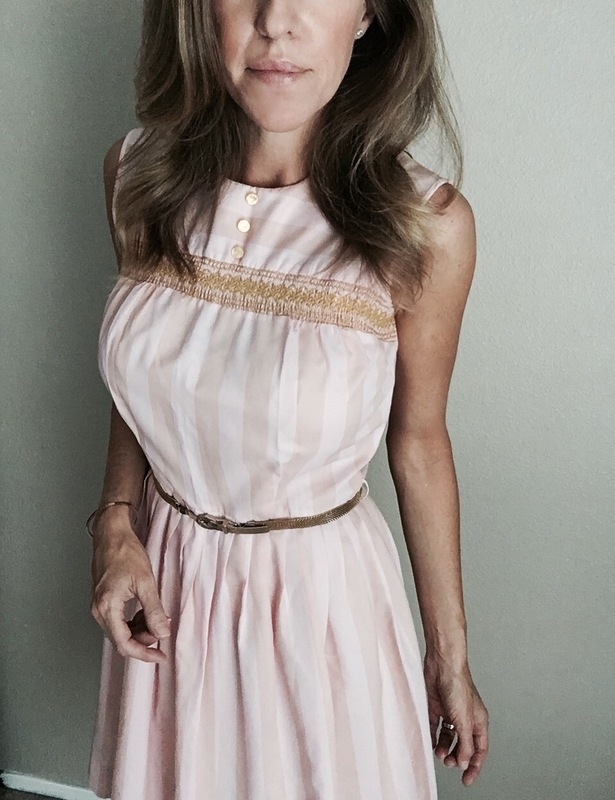 Like vintage, pink dresses and live well! Want some pink vintage dresses of your own too? Click here◄ to find them in my shop. Because Timing is Everything and that time could be right now.